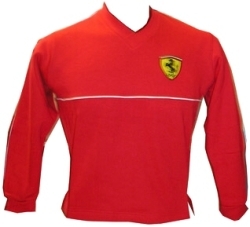 Ferrari V-Neck Sweatshirt for Kids. A GREAT casual, yet chic, shirt for your kid ! Featuring the Scuderia Ferrari shield emblem to the left chest and Ferrari logo to back neck + contrasting white piping.